There have been many books written about different ways to travel to the stars; a few are listed in following text. This chapter describes a few theoretical and feasible travel methods and contrasts them with this most practical, TE's g-force acceleration method. THEORETICAL interstellar concepts have been thought about, discussed, and even written about, but it'll definitely be a while before we use them. Examples include: warp drives and wormholes. WARP DRIVES. Star Trek's "warp" drive is not just science fictional, it's definitely science theoretical. Roger Highfield, Science Editor, UK Telegraph, writes: "Now Dr Gerald Cleaver, associate professor of physics at Baylor, and Richard Obousy have come up with a new twist on an existing idea to produce a warp drive that they believe can travel faster than the speed of light, without breaking the laws of physics. 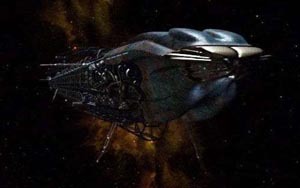 In their scheme, in the Journal of the British Interplanetary Society, a starship could 'warp' space so that it shrinks ahead of the vessel and expands behind it. By pushing the departure point many light years backwards while simultaneously bringing distant stars and other destinations closer, the warp drive effectively transports the starship from place to place at faster-than-light speeds. A new class of solutions of the Einstein field equations is presented, which describe wormholes that, in principle, could be traversed by human beings. It is essential in these solutions that the wormhole possess a throat at which there is no horizon; and this property, together with the Einstein field equations, places an extreme constraint on the material that generates the wormhole's spacetime curvature. Such material would violate all the "energy conditions" that underlie some deeply cherished theorems in general relativity. However, it is not theoretically possible to rule out firmly the existence of such material; and quantum field theory gives tantalizing hints that such material might, in fact, be possible. These and other theoretical concepts definitely require huge advances in current technology before we can actually use them; so, we don't plan to include them in our thought experiment. scenarios require much less technology advance to be utilized. A couple of feasible examples are described below. SOLAR SAILCRAFT. ITSF posts following: "The idea of leaving the engine of a craft behind and using the endless fuel supply of solar or star light seems like a great way of reducing the mass of a craft. The obvious disadvantage is the dependence on a high flux of photons to give the craft the needed acceleration. 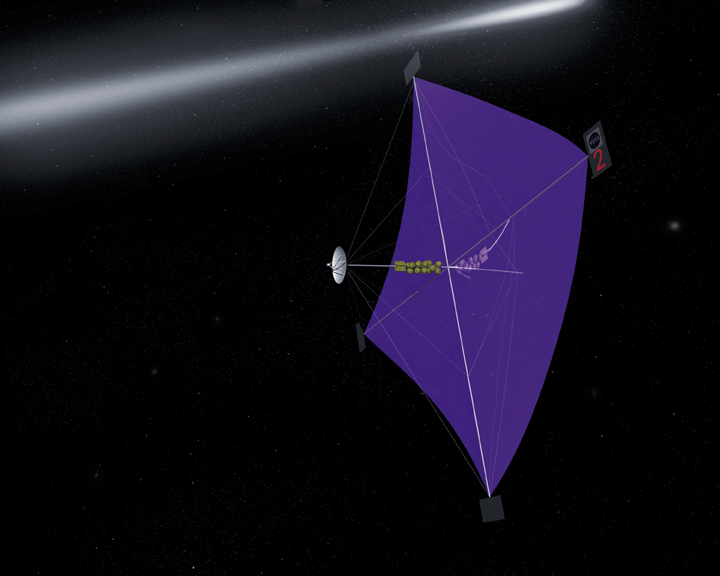 For interstellar travel, light-sail craft have to depend on extremely large-scale constructions such as huge solar-power relays around Mercury and enormous Fresnel zones in the outer Solar System. Since light applies pressure to surfaces, the stream of photons can be used for propulsion in a near-frictionless environment. This concept is the background for light (or solar) sails. It is a method of space travel that negates the need for onboard fuel. Sails using the solar wind or only the light from stars are less efficient at larger distance from the Sun. In science fiction, solar sails are encountered from the 1920s, with early models being giant, multiple-sail craft. In other works, light sails are used to propel ramjets up to ram speeds. To increase efficiency, ground based lasers can be used to push the craft – using monochromatic light increases the reflectivity of the sail material and gives more acceleration. The efficiency decreases with distance, but much slower than if the craft was riding sunlight alone. The laser beam can be refocused by gigantic Fresnel zones. Light sails will have enormous areas, but the craft will carry no fuel or bulky engines. Alternatives to light sails include microwave sails, particle sails, magnetic sails, and laser or solar thermal or electrical propulsion. Basically, the light sail is a use of James C. Maxwell’s discovery in 1873 that light reflected in a mirror applied pressure to the mirror. Since photons according to Einstein have mass then, by using the rather low friction coefficient of space, a craft is able to travel from A to B without having to carry bulky propulsion devices and especially without the need for onboard fuel. This is a large plus in terms of logistics. The fuel is supplied from nearby stars or by high-power lasers." Some futurists speculate that a hollowed out asteroid would make a good, long term habitat, and therefore, an adequate generational spacecraft. For genetic diversity during a centuries-long trip, a generation starship would require at least 160 inhabitants. Sperm banks or egg banks can drastically reduce this requisite number. Also, the ship would be almost entirely self-sustaining (see biosphere and life support), providing food, air, and water for everyone on board. It must also have extraordinarily reliable systems that could be maintained by the ship's inhabitants over long periods of time. It has been suggested that humans create large, self-sustaining space habitats before sending generation ships to the stars. Each space habitat could be effectively isolated from the rest of humanity for a century or more, but remain close enough to Earth for help. This would test whether thousands of humans can survive on their own before sending them beyond the reach of help." Though feasible, thought experiment still considers above technologies as impractical for interstellar methods. Even if successfully implemented, they would take way too long to travel to even the nearest star. No enterprise would sponsor them; no crew/passengers would want to participate in them. Practical methods of star flight need a much shorter flight duration. PRACTICAL for interstellar travel is what this thought experiment is all about. Recent spacecraft history provides at least one example of an attempt to make space travel more practical. Deep Space 1 pioneered ion-electric propulsion in interplanetary space from 1998 to 2001. For more about Deep Space 1. For more about ion engines, read the following.Ion engine removes electrons from a designated propellant gas, such as xenon, to transform gas atoms into charged ions which then respond to electro-magnetic fields. The ions accelerate to extremely high speeds and exit the engine. Electrical power comes from arrays of photovoltaic cells converting sunlight to electricity; thus, this technology is also called Solar-Electric Propulsion (SEP). SEP systems can run continuously for many months or even years so that, despite the low thrust, they may ultimately build up to a higher total impulse (specific impulse times propellant mass) and hence much greater velocities. Ejecting mass at extremely high speed provokes a reaction by the spacecraft to accelerate in the opposite direction. The much higher exhaust speed of the ions compares very well to chemical rocket exhaust; thus, ion engines have much higher performance.Ionization. Electron bombardment ionizes propellant gas. A heated cathode emits electrons, an electric charge accelerates these electrons towards the anode and into a magnetically charged, discharge chamber. Propellant gas enters this chamber for the purpose of colliding propellant gas atoms with electrons. As cathode emitted electrons collide with the xenon atoms, to strip off xenon electrons for positively charged xenon ions which move about very quickly.Thrust comes from high voltage metal grids at the back of the chamber. These grids electrostatically "pull" the ions to increase their speed. Ions reach a velocity of 31.5 km/sec and focus into an ion beam for final exit out of engine nozzle. Finally, a neutralizer injects the excess electrons into the ion beam. This prevents a large negative potential from trailing the spacecraft. 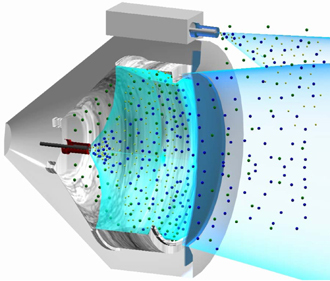 With their high specific impulse(due to high nozzle exit velocities), ion engines can achieve the high velocities for interplanetary or even interstellar flight. INTERPLANETARY EXPERIENCE. Many years of successful interplanetary flights will have happened. This thought experiment presumes interplanetary flights to become routine due to many years of technical improvements to onboard particle accelerators as spacecraft propulsion systems. As these accelerators gain reliability and efficiency, we'll be better able to control the momemtum exchange of numerous ions leaving the spacecraft at near light speeds. The consistent exit of high velocity ions from the spacecraft will impart a small velocity increase to the much larger spacecraft. This exit rate will be controlled to produce constant g-force. CONSTANT G-FORCE. Reliable, efficient particle accelerators enables small velocity increase of 9.80665 meters per second for every second throughout powered flight. This not only shortens the travel time, but it imparts a gravity like force upon the spacecraft, cargo, and most importantly, the crew and passengers. Current space medicine data indicates that consistent gravity is essential for normal health of humans. Unfortunately, there'll be a limit on powered flight duration. STARFLIGHT DURATION. 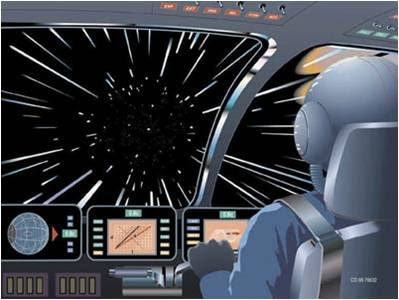 While g-force acceleration shortens interplanetary flights to days, it will still take years for interstellar travel. Of the several relevant problems, consider just two: range and relativity. Powered flight requires fuel; thought experiment assumes daily fuel consumption to require a fraction of a percent of entire ship's mass; this is not a problem for a multiday, interplanetary flight. However, an interstellar flight will last years; such a flight will require more then 100% of the ship's mass just for fuel. This is a problem; however, a more subtle problem is relativity. For example, if the observer travels at .866 c in relation to his original position, he'll still observe c as 299,792,458 meters per second, but his mass will double and his time will dilate by 50%. Time dilation is no problem for an interplanetary flight; after 3 days of powered flight, g-force acceleration will take us to only 1%c. But after years of g-force flight, our notional starship will have easily exceeded 50%c. Thus, the thought experiment assumes initial group of interstellar voyages will approach near light speeds in a cautious manner; carefully incrementing successive flight's maximum inflight speed and observing relativistic effects. Within above constraints, there are still some practical flight profiles. This thought experiment will consider several such profiles in the next chapter. Interstellar Probe Studies at NASA - This page at NASA's Office of Space Science gives a brief overview of NASA's current studies into interstellar exploration. BEACON eSpace at Jet Propulsion Laboratory: Interstellar ... May 1, 2005 ... Title: Interstellar Exploration: Propulsion Options for Precursors and Beyond. Authors: Leifer, S. Johnson, L.
Could you elaborate more as to why you think the fifth or sixth generation would lose motivation.